On a trip to Florence in 2011 I took with me a copy of Ruskin’s book ‘Mornings in Florence’ as I thought it might be interesting to follow in his footsteps. After all Florence has probably not changed that much. I took his advice and spent the first morning at S.Croce : Wait for an entirely bright morning; rise with the sun, and go to Santa Croce... Out in the cloister is my favourite building - Brunelleschi’s Pazzi Chapel. This is the first complete little building in Florence (and therefore in the whole of the Renaissance) to exhibit very clearly a rational, logical, mathematical, and humanistic approach to design. 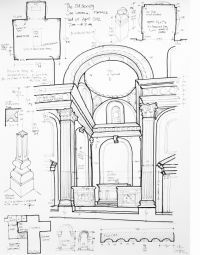 I thought there is something about ideal proportion that can be discovered at the Pazzi Chapel and so I wrote to the Opera di S. Croce and got permission to make measured drawings there. Each morning I drew and measured. This is more difficult that you might think - the place is regularly hit by swarms of excited schoolchildren on educational visits! Later, with permission from the church of S. Lorenzo, I did the same in the Old Sacristy - another building by Brunelleschi, built around the same time and amazingly similar. Looking through my results later I noticed that the height to the top of the main arch at the Old Sacristy (9340mm) appeared to be exactly the same as the height to the lowest point of the main arch at the Pazzi Chapel. 1 braccio = 2 palmi = 20 soldi = 60 quattrini = 240 denari = 2880 punti = 583.7 mm. I divided my 9340mm by 16 : 583.7 mm : Eureka ! 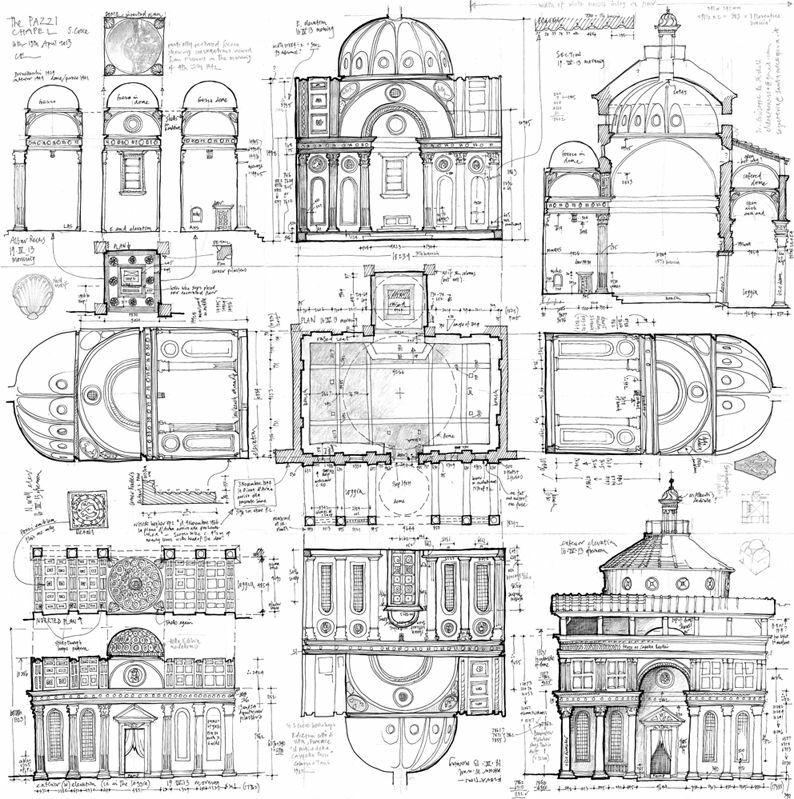 the combined harmonious proportions that Brunelleschi had, in his day, adapted from his study of ancient buildings in Rome. 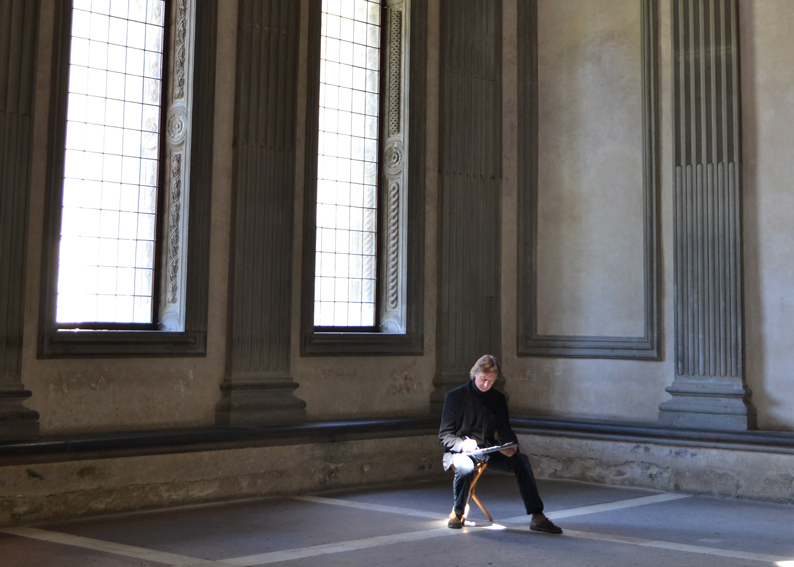 Go to www.chriseckersley.co.uk to read the painstaking way Eckersley installed himself in the Pazzi chapel with a tape measure and sketchbook, measuring, surveying and converting Brunelleschi’s Quattrocento “braccia” to metres. 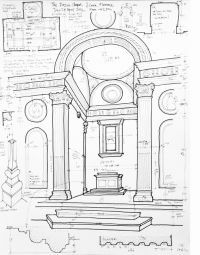 Much the same pursuit that Leonardo demonstrates in his sketchbooks, drawing here is a way of owning the building. Eckersley has a seasoned hand, the result of over 40 years drawing, used here as the primary research that feeds a design sensibility. In place of the lethargic use of the iPhone, the micro and the macro observational sketches chart the marshalling of sensations; drawn on a need-to-know basis. 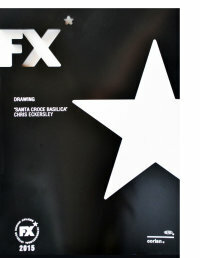 Subsequently I received an FX Design Award for this piece of work.